Don't need a full franchise? Now you can offer your existing customers U-Swirl Frozen Yogurt inside your existing retail or food establishment with our U-Swirl-n-Go® kiosk program. Of course, we continue to offer our full-store concept as well. Our package includes 1-4 state-of-the-art, low maintenance soft serve machines, signage and displays, self-serve station, toppings bar and more. Our all-in-one Frozen Yogurt Station makes it easy for customers to serve themselves. Our customizable cup dispensers and toppings bar allows operators to easily change offerings. And, our user-friendly machines are backed by industry-leading service warranties. Plus, you will receive all the training and support offered to our full franchise owners (see below). 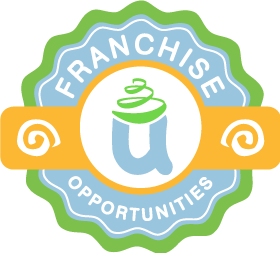 At U-Swirl, we have an incredible culture that focuses on our franchisees’ success. Riding on several decades of franchising experience with our parent company, Rocky Mountain Chocolate Factory, we have developed a system that will help you jump-start your business and provide you with a competitive advantage in your market. As a franchisee, you will have access to all of our support systems and expertise as well as our trade secrets and unique strategies. Our constant efforts and economies of scale help keep product costs low and consistent product available. Additionally, you will benefit from U-Swirl’s brand recognition and the integrity of the U-Swirl name. Through a special arrangement with our parent company, Rocky Mountain Chocolate Factory, you can add a complementary offering of fine chocolates and caramel apples to expand your market! U-Swirl’s premium and top-quality distinctive flavors are developed by some of the most knowledgeable yogurt innovators in the industry. U-Swirl’s product is certified to contain live and active cultures to promote good health, plus its creamy texture, original flavors and extensive toppings have been praised by the masses as the best tasting and highest quality frozen yogurt available. The U-Swirl name assures your customers that they can expect the same great quality frozen yogurt time after time.